Gay rights charity Stonewall has announced a thousand London buses will carry its equality message in April during the government’s consultation on how to implement marriage for gay couples. During this month, public transport in the capital will display the ‘Some People Are Gay. 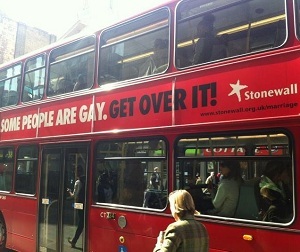 Get Over It!’ adverts with a link to Stonewall’s equal marriage campaign website. The charity is asking Londoners and visitors to the capital to tweet pictures of the buses using the hashtag #equalmarriage, so its message is not confined to the city. Ben Summerskill, Chief Executive of Stonewall said: “In recent months Britain has been subjected to vitriolic political campaigning from people who want to impose their 19th-century values on 21st-century society. Last month, Stonewall published its response to the government’s consultation on marriage equality in England and Wales, saying civil partnerships had not been ‘sufficient to diminish the remaining prejudice against gay people’. The charity has also promised to send a range of ‘Some People Are Gay. Get Over It!’ merchandise to whoever sends in the best picture of a bus each week until the campaign ends in early May. Editorial: Should we ditch the term ‘gay marriage’?